Well, we took a 2 week vacation and I didn’t take one picture. Now that we are back it has taken us nearly 2 weeks to tame the yard and gardens again. And I will never believe the English gardening lady who wrote that you should always use garden compost to mulch your flower beds and not use shredded bark mulch. Well, that is all well and good if you never leave your garden and are there every day to keep up the weeding. However,when you return from a holiday and all the pumpkin and hay seeds are a foot tall in all your ornamental beds you feel like screaming. 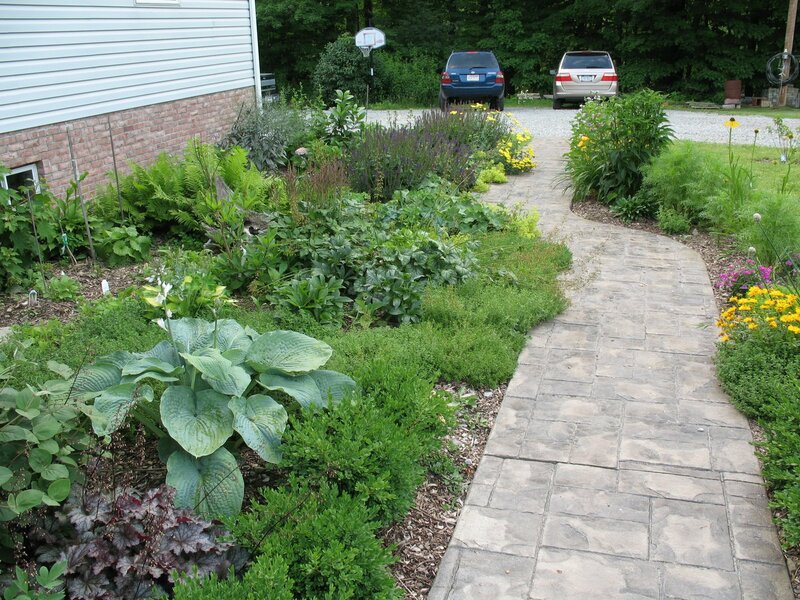 Note to self: order the mulch early next year so the mulching is done before the plants are as big as VW Bugs. 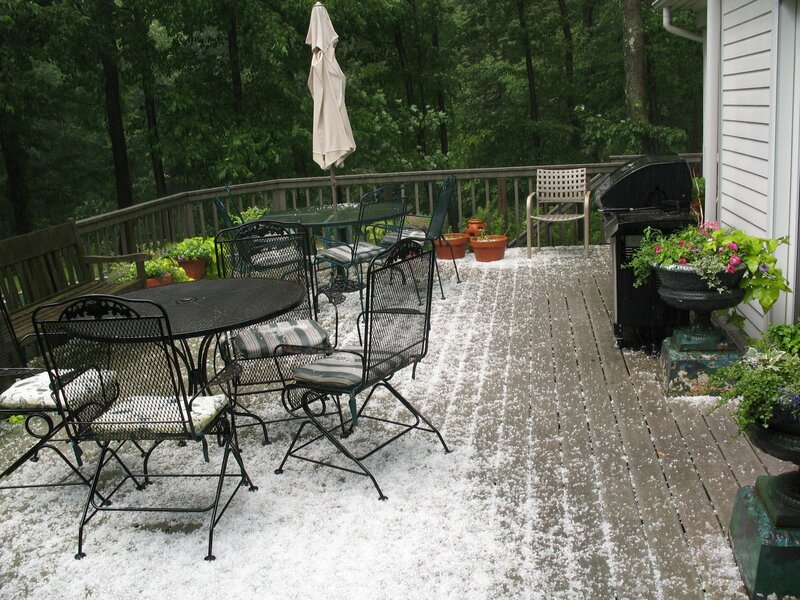 I think I need to talk to Al Gore, this is what it did in Pennsylvania on June 20th. 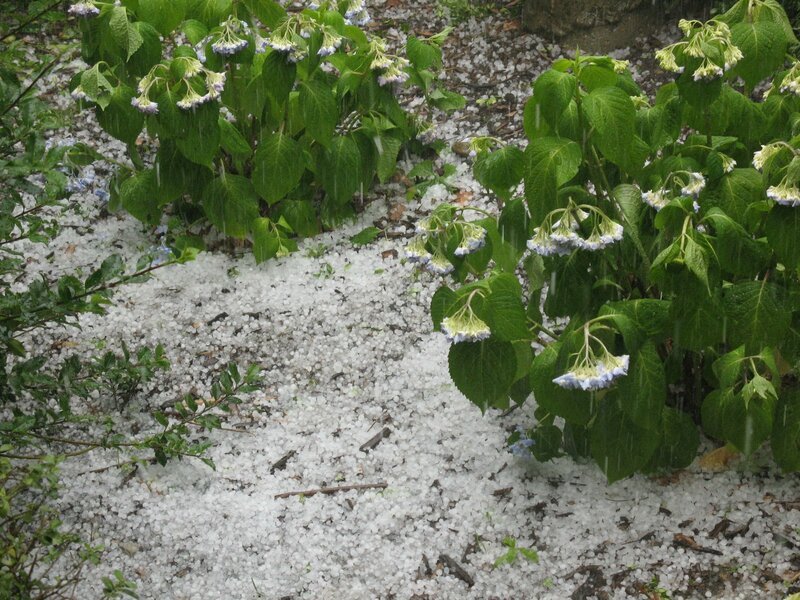 Hail the size of marbles, big marbles. Our blueberries look pretty bruised and the husband is worried about his crop. My peas got banged around but their shells protect them, blueberries are right out in the open without any protection. I will let you know how they taste. Look what I found among the weeds of my veggie garden. A pitcher plant. They are relatively rare, blog plants which eat flies, I believe. I was amazed and a little concerned that the ground near the veggie beds is this wet. 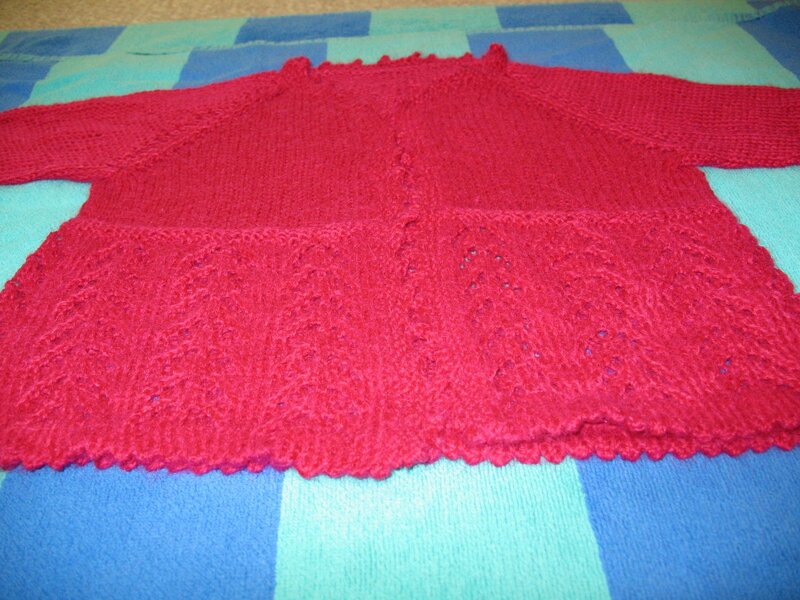 There has been knitting…there are many new babies to cover so I have knit the Helena sweater from the new Knitty. Needles: Size 5 and 2 Addi Turbos, 24″ circs. Modifications: I changed the edging around the front, made it a picot edge and used three buttons rather than the ties. I also made a hat to match which I will add as soon as it is dry. I love this yarn but it has absolutely no body and I am not sure I am happy with the drappy nature of the bodice. 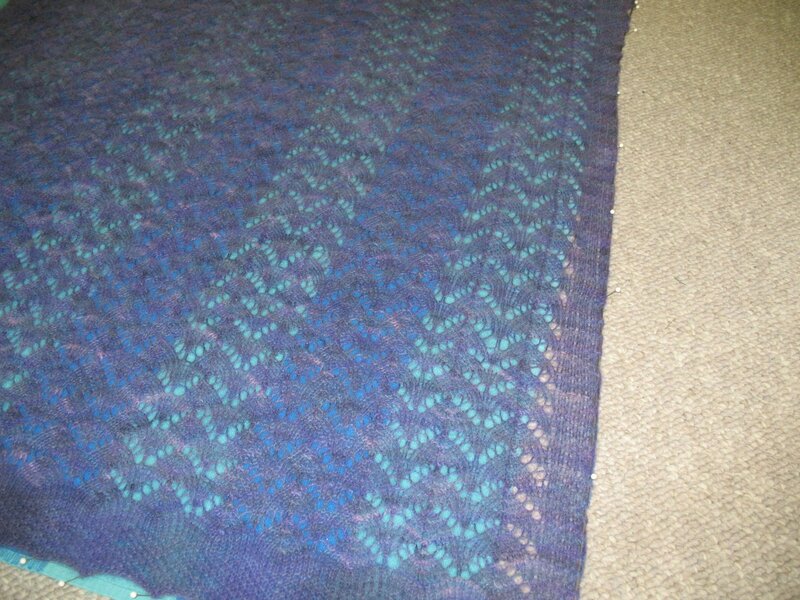 Everyone I showed it to assures me it is fine but I would have knit a much firmer fabric. 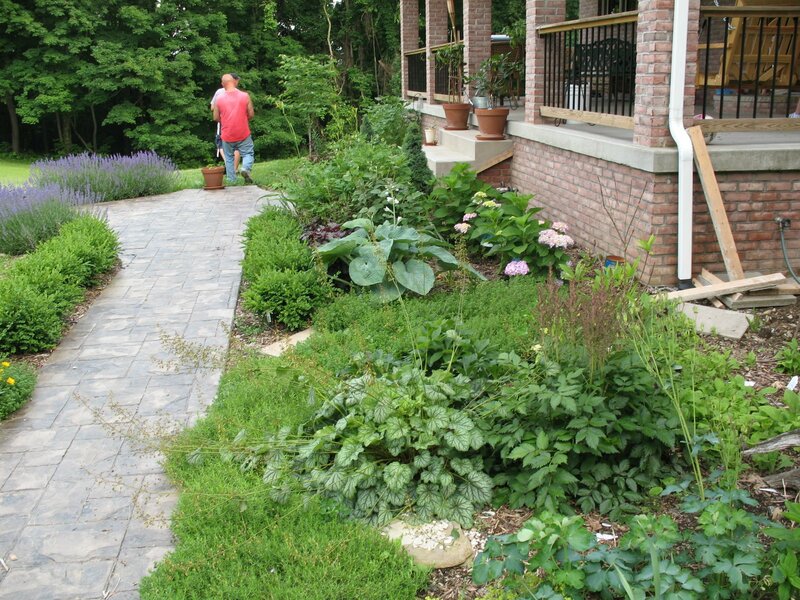 I am thrilled to show you some shots of a garden I designed and planted last spring for my friend Marie-Paul. She and her husband JT had just finished building a new home when their 12 year old son was diagnosed with a brain tumor. After 6 months of surgeries, radiation and chemotherapy, I wanted to give them something to brighten their lives. 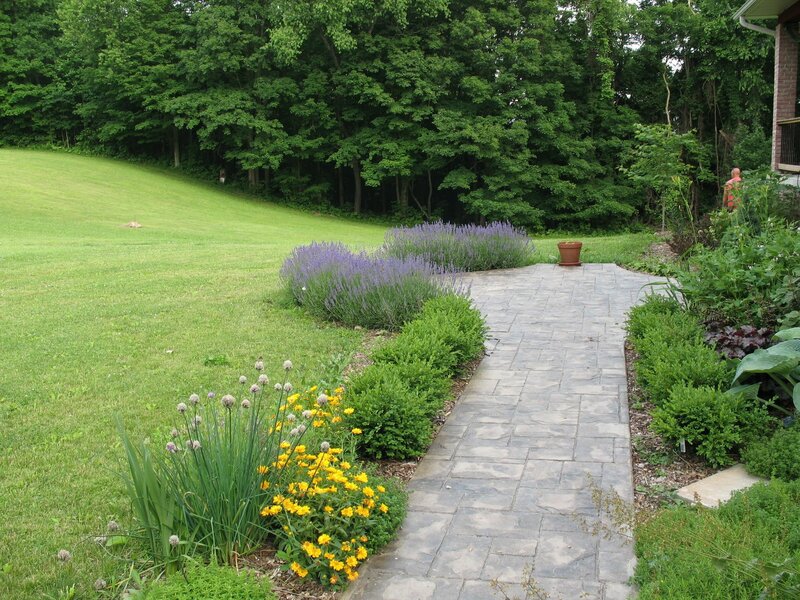 Marie-Paul is from Belgium and loves flowers and gardens and didn’t want anything to do with typical foundation plantings. I think we came up with a nice solution and she seems to be very happy with the results. Isn’t her lavender hedge gorgeous? All the plants came back beautifully but one. This is amazing for our climate and the generally clay soil we have here in the mountains of western PA. We amended her soil with yards and yards of composted horse manure and I think the plants are very happy. She would like to have an arbor at this end of the walk someday. Another friend lost her son this spring. He was the same age as DD#1. They were good buddies in elementary school and graduated together. I wanted to do something special for her. When ever a female friend is going through chemotherapy I like to knit them a shawl so they can stay warm during their treatments. I thought she could use something warm to wrap up in this winter to remember her beautiful, strong son hugging her. So I knit her a pray shawl too. 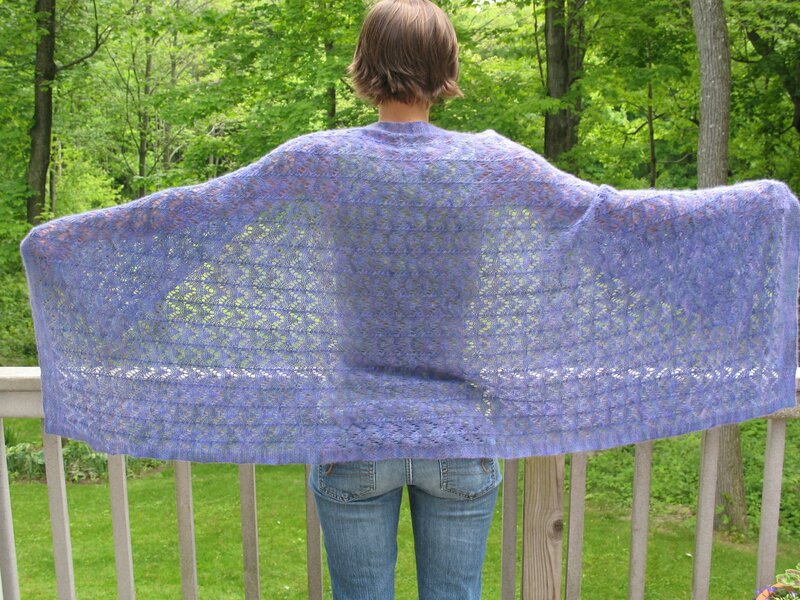 Pattern: My own design, I think it is the horseshoe lace from Barbara Walker, not sure which book. DD#2 looks especially fetching, don’t you think? Doesn’t every 20 year old need a cashmere shawl? I think I could have a full time job just keeping she and her sister in knitwear. 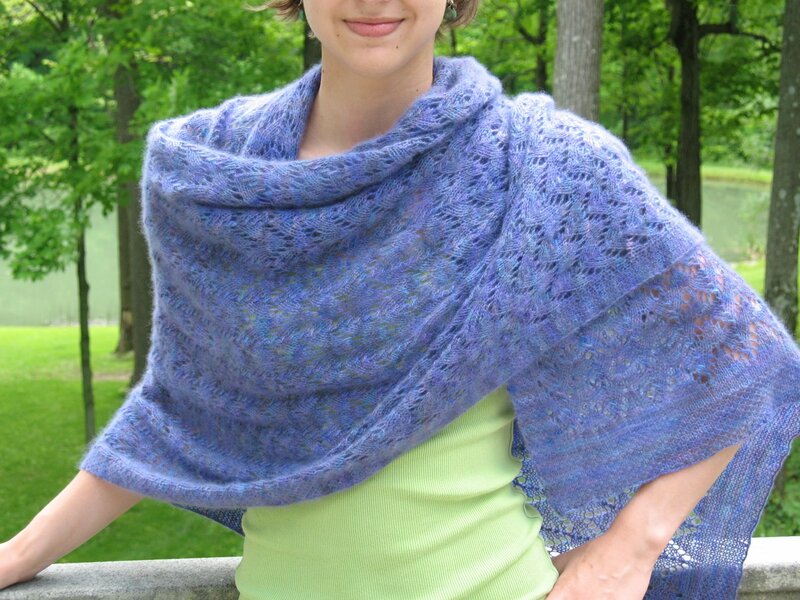 Let’s see, Fair Isle vest, Aran cabled sweater, hats, gloves, mittens, scarves and now shawls. Luckily they are both very thin and we all share the same color sense so I love knitting for them. Have a great day and if you love gardening check out the Margaret Roach gardening blog I just discovered, awaytogarden.com. It is fantastic. 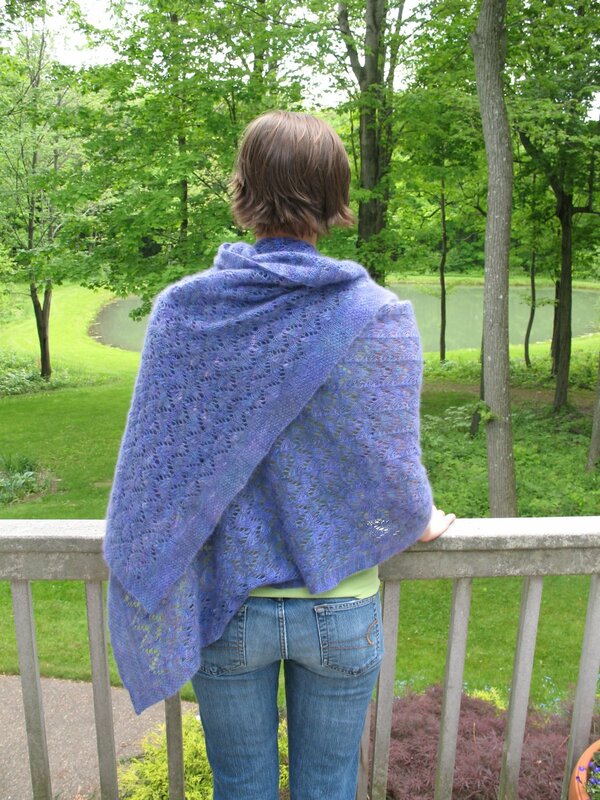 The garden and shawl are both gorgeous! Those ladies are quite lucky to have found such a thoughtful and generous friend in you. thanks for the nice words about my blog. 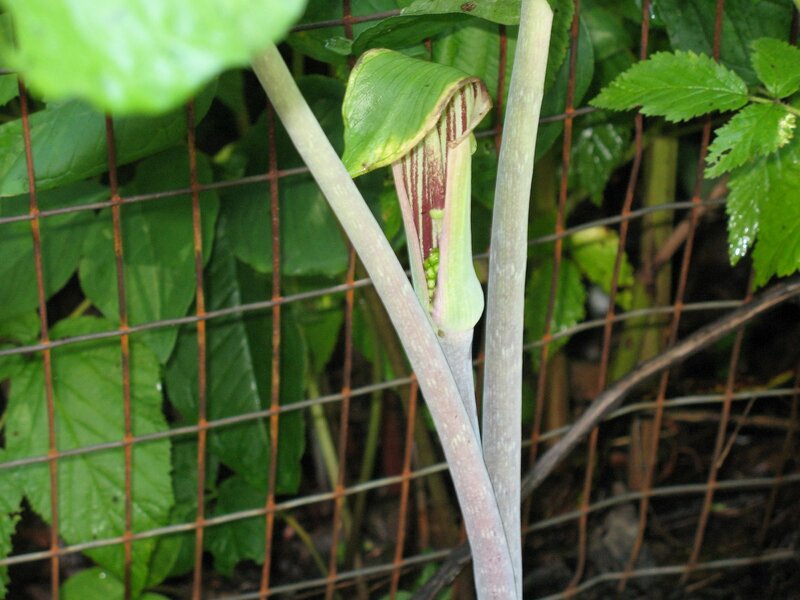 i have the same wildflower in my veggie garden this year–it’s a jack-in-the-pulpit, or Arisaema, native to the woods. what a coincidence!